UTHSC Vice Chancellor Kennard Brown in front of a banner signed by students and staff. 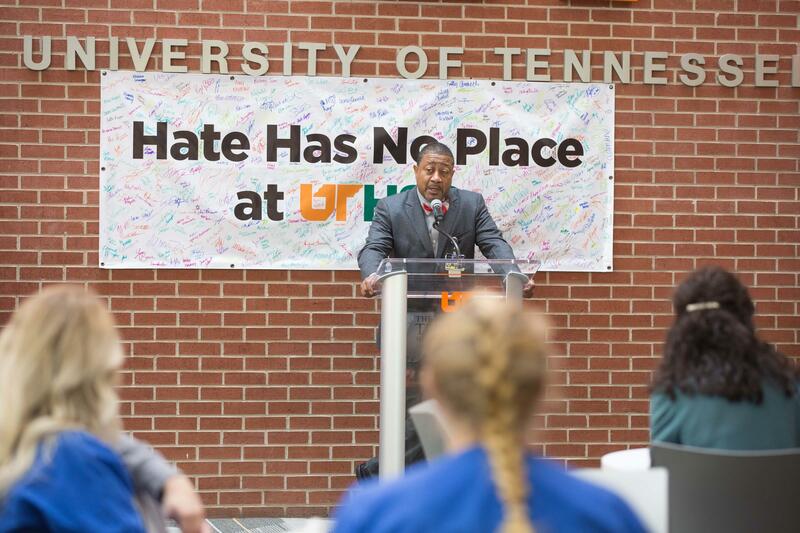 Recent acts of violence across the U.S. prompted officials at the University of Tennessee Health Science Center to host a show of unity on its Memphis campus. Students, faculty and staff joined together Nov. 8 to hear speeches reinforcing a message of acceptance and diversity. "Hate has no place at UTHSC," read a banner signed by participants. The event coincidentally coincided with a viral photograph of a man wearing a racist t-shirt at a polling place in Olive Branch, Miss. He was identified as a registered nurse employed at Regional One Health in Memphis. The employee was fired after questions were raised about his ability to serve a racially diverse community of patients. While the UTHSC forum was unrelated to that incident, Vice Chancellor Kennard Brown said the show of solidarity was a message to patients whom medical students will go on to serve. “We want people to know that as a result of where they trained, they will embrace every patient that they see throughout the entirety of their career--no matter what socio-economic status, sexual orientation, faith-based religion, race, it will be of no consequence," Brown said. The lunch-hour event didn’t focus on current politics, but two moments of silence were held to remember recent victims of violence.